When I first approached consultations, the goal was to tell them about me, my services, and get them to book. It was mostly about me and what I offer and do. While there’s nothing wrong with sharing those things, you have to find a way to make it valuable to your clients as well. Educate and empower them and they’ll leave feeling like their time was well-spent, which is a very good thing for you. Talk about how long things take on the day of the wedding. Give them tips for making the wedding day go smoothly. Tell them what they should be thinking about as they consider what photographer would be best for them (making sure to highlight places where you are particularly strong). There’s a number of different things you can do here, so figure out what works best for you and run with it. If you do portrait consultations, talk about outfits, locations, why your favorite products are the best way to display their images, etc. 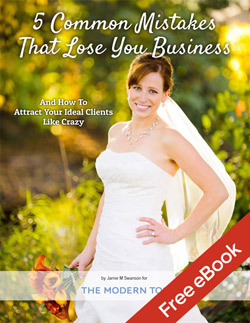 There’s tons of value you can give to your client. Share this with them! They’ll understand that you care about them, that you want them to make a good decision, and that you care about them as a couple and not just about their money. If you can make a personal connection with your clients, they’re more apt to book with you. While we like to think we make rational decisions, research shows that we actually use our emotions to make decisions and then create rational arguments to back them up. 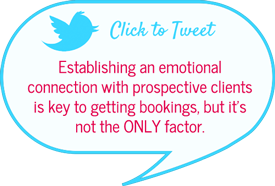 Establishing an emotional connection with prospective clients is key to getting bookings, but it’s not the ONLY factor. After my initial selfish way of approaching consultations by only talking about me and my services, I swung too hard in the other direction. I didn’t talk about my contract or prices hardly at all and just tried to make it a casual conversation about them and their wedding over coffee to build rapport. I only brought up the details if they directly asked about it and just kept them talking about themselves and their wedding. I assumed they looked through all the details I sent them via email before the meeting. While I think it worked better than the first approach, people didn’t learn enough about our services and had lots of questions afterwards, and I’m sure I lost people from a lack of information being presented. At worst, I’m afraid people felt like it was a waste of time. The best way to approach this is to start the consultation by asking about them and their wedding. Make mental notes of what they talk about – these are the things that are important to them. If you ask them to tell you about the wedding and they gush about their amazing flowers, you know they value this and you can talk about how you spend time photographing the details, such as the flowers, that they are putting so much time and money into planning. Connect and discover their passions so that you can create an emotional connection to your services. At a wedding, you always take photos of things like the flower arrangements, so it’s not like you’re just saying what they want to hear (that’s a VERY bad idea, so don’t say it unless you actually do it!) You’re simply confirming that they will be getting the things that they really want if they hire you. This relates to education, but I wanted to separate it out because it’s easy to forget that our clients don’t know what they need to do to book us. Make it clear. Tell them every. single. step. of the process. For example, explain that once they decide on a package, they will email you with their decision, then you’ll write up the contract and send it to them. Then they’ll sign it and send it back with a check. Once you get it, you’ll sign it, copy it, and send them a copy for their records and they’ll be booked. The more you can make things crystal clear, the better. It’s NOT obvious to them, and making it clear makes it easier for them to book you. 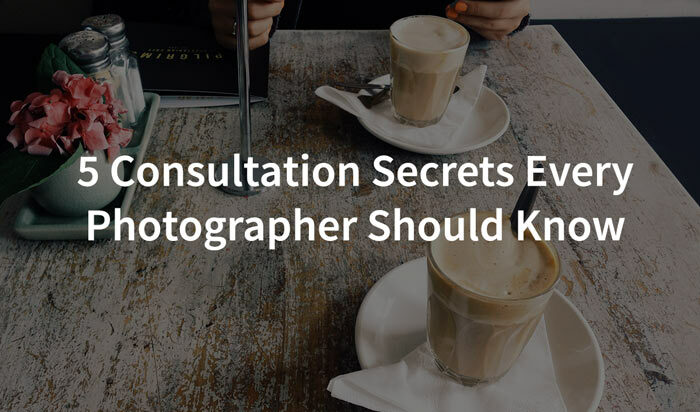 Think about the hesitations your clients may have before you even get to the shoot, and make sure to address them before they even mention it. This is a GREAT way to encourage them to hire you and help prevent them from going elsewhere. For example, talk about how you do everything you can during the day to make sure the bride looks awesome in her photos (because ever woman worries about how they look in photos). Providing answers to these hesitations before they even mention them makes it that much easier for them to book you. There’s less holding them back, and by attacking these hesitations head-on you’re actually helping them feel like you relate to them better and would be a good fit for them. Make sure you know exactly what your clients are worried about and that you’re not simply showing your own insecurities here instead. For example, if you’re insecure about your pricing, you may go on and on about how your prices are reasonable or why they should hire you and it could come across as insecure and actually hurt you (especially if they don’t think your pricing is too high). Instead, throughout the consultation, talk about how much value you’re providing (without mentioning cost) and they’ll get it implicitly. If you’re not confident about what you are offering, it will be clear and your clients will doubt if you’re worth it as well. What do you want them to do next? Tell them. If you just end with something along the lines of “Any questions? No, well thanks for your time, bye!” then they won’t know what you’re expecting them to do next and you’re more likely to be disappointed that they haven’t gotten back to you or done what you were hoping they’d do. So if you want them to book at the consult, ask them if they are ready to book. (This is most effective when you’ve told them before hand that they can book during the consultation if they are ready). If you want them to think about it and get back to you later, ask them to do that. Whatever you want them to do, TELL THEM. It doesn’t have to be pushy. Sometimes we all just need a little nudge in the right direction to finally make a decision. How exactly do you do all this and sound natural? I’m going to tell you exactly how I put all of these things into practice, including the specific words that I use, so that you can use this in your own consultations to get more clients. I’ve decided to send this exclusively to my free Exclusive Insider’s Club via email as a “Thank You” for joining. All you need to do is enter your email below and click “Join Us”. Next comes a welcome email with information on where to find my consultation secrets and then you’ll get exclusive content going forward. Super easy. I promise never to sell your email address, and if you ever decide it’s not for you, you can unsubscribe with a click of a button.